Back cover blurb: 'A dark and gripping thriller that vibrates with tension...a must-read for thriller lovers' Kate Furnivall 'A rollercoaster of suspense and intrigue...' Rosanna Ley It's the perfect love story. Lily meets Ed at a party, and on their second date, he proposes. She's a lawyer, he's an up-and-coming artist. They own a small but beautiful flat in London and mix with all the right people. But Lily has a secret. Something from her past, that is soon to collide with her present. And she thinks her new husband is hiding something too... The vows they made will soon be tested to the very limits. 'Till death us do part...' Perfect for readers of Liane Moriarty and Clare Mackintosh, lose yourself in the twist-filled story that everyone's talking about. My Husband's Wife is a novel of two halves. Then the little girl from the flat across the way appears in their lives in a whirlwind of activity and gives them a perfect distraction from each other. As Lily's work becomes more involved and high profile she spends less time with her husband at home and more time in prison with the offender that she is trying to get released on appeal, and in the courtroom with her more experienced legal colleague who is assisting the case. Soon their time spent with Carla on a Sunday is the only time Lily and Ed have together, but even then Lily is working, and Ed is sketching the little girl, hoping to submit his work to a local art competition. But is soon becomes clear that it is not only Lily's career that Carla is after. I can't say much more without giving anything away, but this is a brilliant novel, a fantastic debut, and I can't wait to read more from this author. 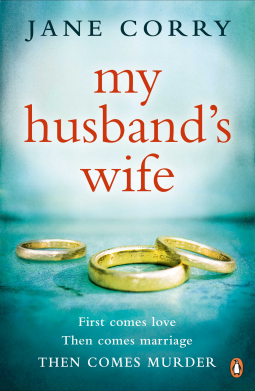 My Husband's Wife is available from 25 August 2016. You can pre-order it now via Amazon online. Thank You to the publisher who approved my request via Netgalley in exchange for an honest review.